Profits from a Christmas play, where the cast is made up of local NHS staff, will be donated to wards at Harrogate District Hospital. The Trust Us Theatre Company, made up of healthcare workers including a majority from Harrogate and District NHS Foundation Trust, brings ‘Comfort and Joy’ to Knaresborough’s Frazer Theatre from 22-24 November. All profits from the play will be donated to the Acute Medical Unit (AMU) and Clinical Assessment, Triage and Treatment (CATT) Ward at Harrogate District Hospital. ‘Comfort and Joy’ follows the Duggans, as their extended family arrive for a proper family Christmas. Despite bucketfuls of Christmas spirit, what comfort and joy there was at the start of the festivities soon disappears in the face of deeply held grudges, rampant pets and grotty plumbing. Add in a few frankly nutty neighbours and carols, and you have all the ingredients for a classic. ‘Comfort and Joy’ is written by Mike Harding. Stephanie Davis, Matron at Harrogate and District NHS Foundation Trust, is a member of the Trust Us Theatre Company. She said: “We encourage everyone to come along and see ‘Comfort and Joy’. The Christmas classic tells the story of the Duggan family’s Christmas, with plenty of comedy and festive twists and turns. 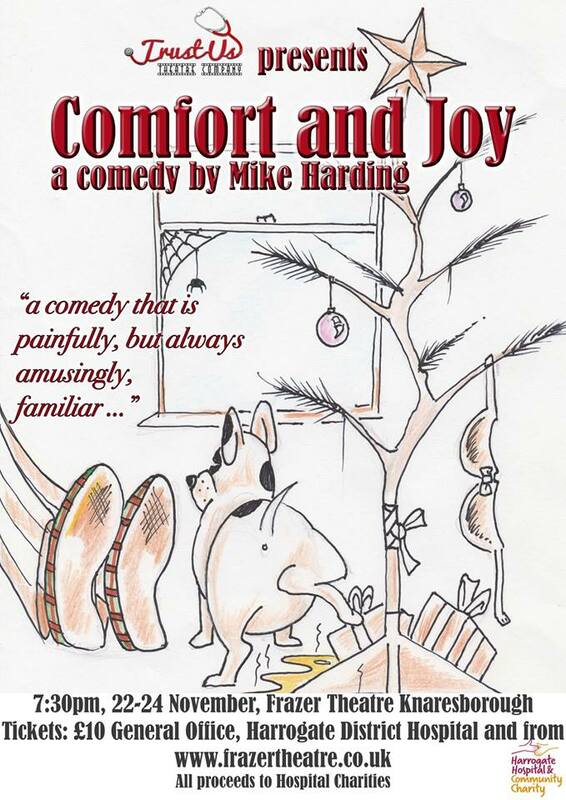 ‘Comfort and Joy’ runs from Thursday 22-Saturday 24 November, at the Frazer Theatre in Knaresborough. To find out more and to buy tickets, visit www.frazertheatre.co.uk/. Tickets cost £10. Harrogate Hospital & Community Charity is the Charity for Harrogate District Hospital and Community Health Services. The Charity raises funds to help do more for local patients and their families when they need it most. They fund specialist equipment, training and services over and above what the NHS provides, and raise funds for individual departments and services and the charity as a whole. To support Harrogate Hospital & Community Charity, visit www.hdft.nhs.uk/hhcc. Contact: David Fisher, Community and Events Fundraiser, david.fisher@hdft.nhs.uk and 01423 555641.